Augmented Reality is one of the hottest topics in marketing today and there is no sign of the buzz subsiding. Always on the cutting edge, fashion brands have been quick to jump on the bandwagon. 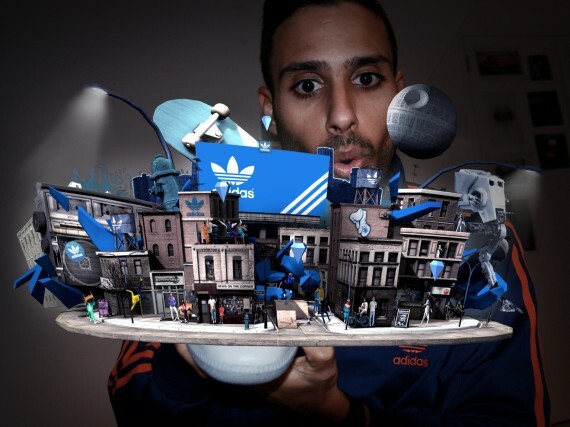 In January 2010, Adidas released this awesome teaser about the first sneakers with an Augmented Reality experience built in. Now that the sneakers are available, all that the customer has to do is hold up the sneaker to a webcam and they can unlock the Adidas Neighborhood. Adidas plans to introduce three augmented reality games into the virtual neighborhood, including a skateboard game, where the sneaker acts as the controller to navigate the virtual city’s alleys, a Star Wars-like game with the sneaker and a music-based game. Obviously this is a bit of a gimmick (like most Augmented Reality to date), but it will be interesting to see if moves more shoes for Adidas. Note: Maloney on Marketing readers would know these are not the first sneakers with Augmented Reality. Dunlop did it with Commonwealth Bank in 2009. T-Post is already cutting edge, known as the world’s first wearable magazine, where every 6 weeks subscribers receive a new T-Shirt in the mail with a news story interpreted by a different designer. Now T-Post have developed an Augmented Reality T-Shirt that features the ever popular Rock, Paper, Scissors game. Why should adults have all the Augmented Reality fun? Now Brights & Stripes have come out with the Magic Tee, a range of kids clothing that is interactive. Kids will LOVE this, and it is probably the biggest market for Augmented Reality yet. Check out my previous posts to learn more about this cutting edge technology and how marketers are using it in their marketing strategies. Is the next big thing in business cards augmented reality? This just blows my mind! I cannot believe the rate of technological expansion. It truly does pose the question…”just what will they think of next?”. What a wave this will create for so many industries to now decide if to jump on board this amazing means of promotion.